You may have read our article about IQ (intelligence quotient) and be using our smart baby tips, but did you know that as your child goes through school, forms relationships, and enters the workforce, his EQ, or emotional intelligence quotient, will be just as important? The term “emotional intelligence” first appeared back in the 1960s, and reemerged with a bang in the 1990s when a bestselling book by Daniel Goleman turned EQ into a buzzword. Since then, research has connected superior emotional skills with a host of positive outcomes. Recognize and Label Emotions – Knowing what we are feeling (or what others are feeling) and being able to label it. For example, when we feel bad we can discern whether it’s disappointment, frustration, or anxiety. Understand Emotions – Knowing why we are experiencing a feeling. This includes learning what triggers different emotions in ourselves and others. Manage Emotions – Knowing how to deal with our emotions and other’s in a productive way that avoids conflict or self-destructive behavior. Feel Empathy – Being able to understanding what another person is feeling and respond with care. 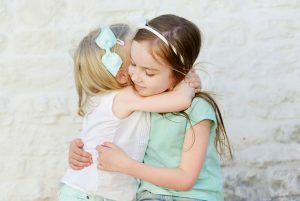 Children and teenagers with a high EQ tend to have an easy time making friends and getting along with others, while those with a low EQ experience higher levels of conflict with others. This carries into adulthood, where adults with a high EQ feel comfortable navigating the emotional terrain of relationships and do it in a productive way. Adults with a low EQ are more likely to experience aggression and other problems in relationships. One of the reasons highly emotionally intelligent children and adults thrive in relationships may be because they’re perceived as more likable. They’re seen as more pleasant, easy to be around, and empathetic. IQ plays a large role in academic success, but studies have found that the highest-achieving students also have a high EQ. Researchers think this is because the combination of IQ and EQ allows a child to use thinking and feeling together to learn and thrive in a group environment. EQ contributes to motivation, goal-oriented behavior, and being able to work cooperatively with others. Students with higher EQ are less likely to skip school, act out, display poor decision-making, or be involved in bullying as either the perpetrator or the victim. They know how to be assertive without being aggressive, and they have an easier time accepting and moving on from the inevitable failures involved in learning. These qualities of EQ are linked to success in the workplace as well. EQ is a main ingredient in leadership, teamwork and productivity. Those with higher EQ tend to be happier and have better self-esteem. They are also self-confident without being arrogant. This is important to note because arrogance can arise from self-confidence, but it is associated with low EQ. Higher EQ has also been linked with lower rates of anxiety and depression. This may be due to the fact that people with a high EQ are more likely to deal with their emotions in a healthy way, rather than avoiding them or turning to drugs or alcohol. Research shows that during the first five years of life, a child’s experiences wire his brain for how he will manage emotions in the future. During these first years of your child’s life, you play an especially important role in his emotional development because his feelings are big (sometimes overwhelming) but his capacity for managing them is still small. He will look to you for help dealing with his emotions, and he’ll observe the way you deal with your own. To learn about how emotions evolve during the first two years of life, see our articles about the evolution of emotions during the first and second years of life. To find out what you can do today to support your baby’s emotional development, our article about raising an emotionally intelligent child has helpful tips.